It’s rife in America, thousands incarcerated and abused for political reasons – notably people of color and Muslims, deplorably treated like fifth column threats. 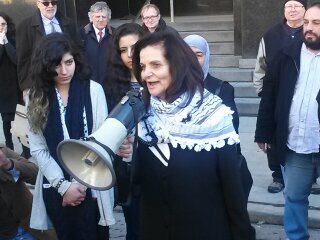 Chicago-based Palestinian/American Rasmea Yousef Odeh is a noted community leader, an activist, feminist, educator and champion of human and civil rights, a widely respected figure. Born in Palestine, she was victimized by Israeli viciousness, imprisoned unjustly in its gulag from 1969 – 1979, horrifically mistreated, tortured and sexually abused. Her sentenced was commuted as part of a prisoner release deal. Deported to Lebanon, in 1995 she emigrated to America, becoming a Chicago resident in 2005, continuing her activist work, ongoing for over 40 years. In October 2013, she was arrested in Chicago, prosecuted in Detroit, the jurisdiction where she applied for citizenship, wrongfully charged and convicted for unlawful procurement of naturalization – pertaining to allegedly lying on her 1994 immigration application, omitting her lawless arrest and imprisonment in Israel nearly five decades ago. She committed no crimes. So-called evidence of her involvement in 1969 Jerusalem bombings was based on her confession under torture, given to stop the pain, not for any wrongdoing. Israel pressed for her prosecution in America. US Muslims are war on terror scapegoats, unjustly vilified and abused. Judge Gershwin Drain sentenced Odeh to time served, 33 days in 2014, a $1,000 fine, plus loss of citizenship and deportation to Jordan. Last Thursday in Detroit federal court, during her sentencing hearing, she recounted her horrific mistreatment, along with conditions under brutal Israeli occupier. Here’s what she said in full, a moving, forthright, factual statement by a glorious woman, deserving high praise, not what she’s been put through. “On this court’s platform, I’m standing today to raise my voice on behalf of myself as a Palestinian woman and on behalf of all Palestinian people, whether under occupation, in refugee camps, or scattered in exile across the world,” she began. “At the same time, the US government calls us terrorists by placing all of our legitimate resistance organizations on its terrorist list!” – because Israel demand it. A powerful statement by a glorious woman about to be wrongfully deported to an uncertain fate in Jordan – because Israel wants her persecution, pain and suffering continued, no other reason.